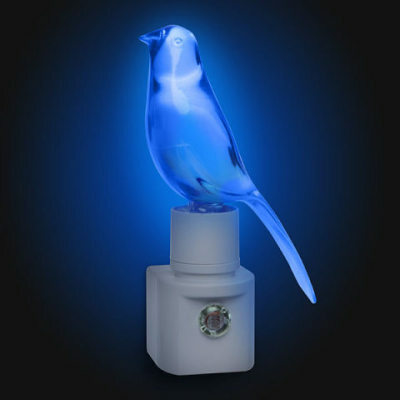 This eztremely cool blue canary nightlight will brighten a hallway or bedroom at night and look very neat doing so. This little avian lamp plgs into an outlet and has a light sensor to allow it to automatically light only when the envionment is dark and the LED bulb gives a bright light while being very efficient. The four inch blue bird will delight any parakeet or canary owner and is a great gift for all bird lovers. For mor information about the blue canary automatic nightlight, click here.